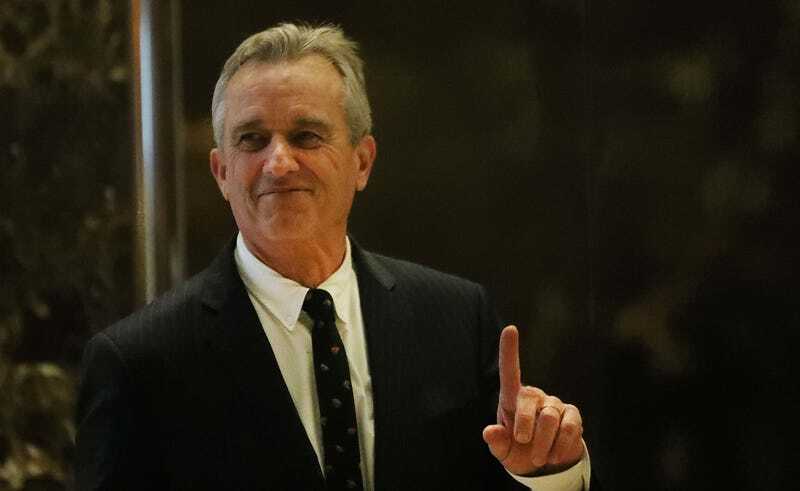 On Tuesday, Donald Trump asked Robert F. Kennedy Jr., a vaccine critic who once wrote a book arguing that flu vaccines are linked to autism, to chair a committee on vaccine safety. Kennedy has accused government scientists of being “involved in a massive fraud” to cover up safety concerns associated with vaccines. In case it’s not obvious, appointing a noted anti-vaxxer and conspiracy theorist to lead a team responsible for “vaccine safety and scientific integrity” is a very, very dumb thing to do. “I said I would,” Kennedy told reporters this afternoon when asked how he responded to the President-elect’s job offer. This is not the first time that Trump has entertained the completely whackadoodle, fringe anti-vaccine movement. Over the summer, Trump met with Andrew Wakefield, the discredited researcher whose launched the anti-vaxxer movement with a debunked study suggesting that a vaccine against measles, mumps and rubella could cause autism. Let’s be clear here: there is no significant “debate” over whether vaccines cause autism. They do not. Wakefield’s original study was thoroughly debunked and retracted, and no work since has supported it. Nonetheless, in recent years, the anti-vaccine movement has spread. And while it’s unlikely that Trump could do much to affect the availability of vaccines at a policy level, having support for the anti-vaccine movement in the Oval Office is sure to elevate the cause. That could have very real public health consequences. Already, as the movement has spread, we have seen a resurgence of diseases that were once no longer a problem in America. The spring of 2015 saw the first death from measles in the United States in 12 years. That same year, vaccine refusal helped spur a measles outbreak at Disneyland. Vaccines avert between 2 and 3 million deaths annually, according to the World Health Organization. But keeping diseases like measles under control requires that the vast majority of children continue to get immunized. Support for an anti-vaccine platform in the White House could literally mean that people die.